Place this contemporary Safavieh Courtyard area rug in your home for a piece that makes a statement. Decorate the right way with this indoor/outdoor piece constructed from plush synthetic material. This product is machine-made, which assures quality. Make a bold statement with this floral plants patterned grey rug. 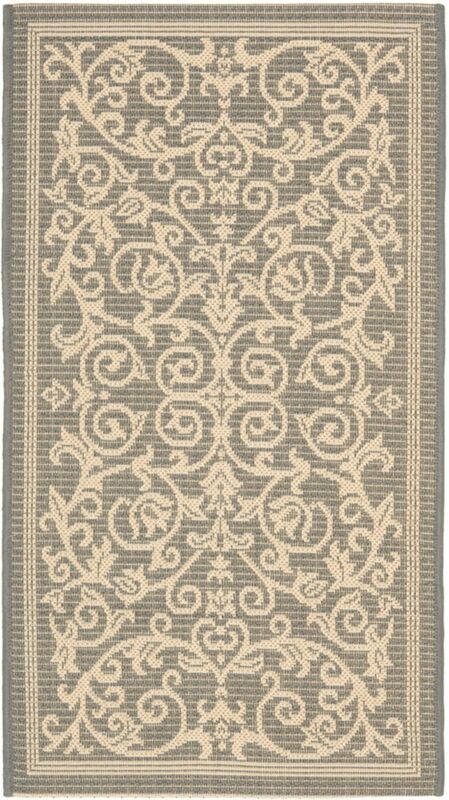 Add this high quality Safavieh Courtyard area rug to your home for an instant splash of style. Decor done right with this indoor/outdoor piece, and its plush synthetic material. This machine-made rug makes long-term decorating easy. Bring this border patterned red rug into your living spaces for a contemporary design aesthetic. Courtyard Marc Grey / Natural 2 ft. 7 inch x 5 ft. Indoor/Outdoor Area Rug Place this contemporary Safavieh Courtyard area rug in your home for a piece that makes a statement. Decorate the right way with this indoor/outdoor piece constructed from plush synthetic material. This product is machine-made, which assures quality. Make a bold statement with this floral plants patterned grey rug.